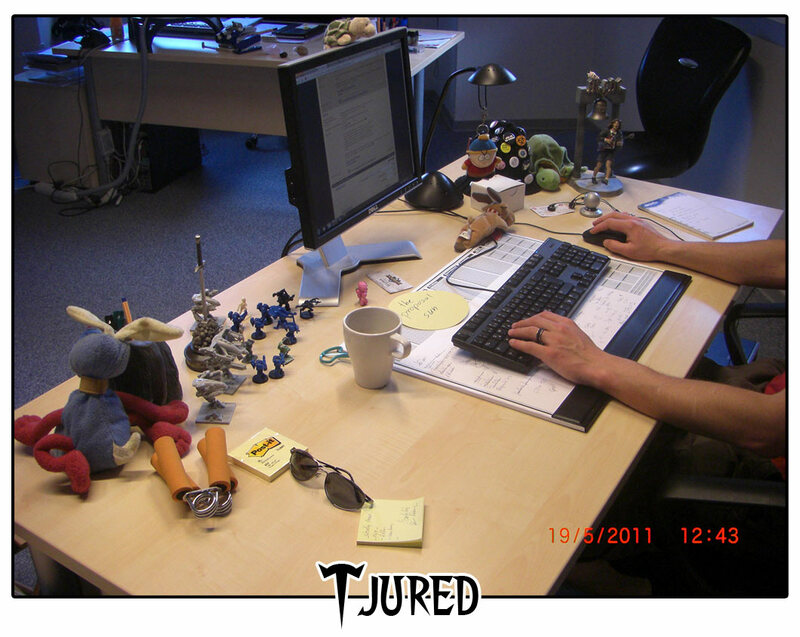 Hello Tjured and thanks for taking interview! Who are you? The mysterious guy who replying mails and forum messages?! Alright, let's start. I am Tjured and I hope that I am not that mysterious :). But yes, actually I answer most of the emails that are send to fansites@tibiame.com, write the news and post on the forum and sometimes I write something on our official facebook page www.facebook.com/TIBIAME. First of all we need to ask you some personal questions about you, so... let's get started! Unfortunately, in January. I am not a big fan of winter and would prefer sun at birthday parties. I was born in Regensburg (you know, the CipSoft hometown in Bavaria, Germany), but I grew up in the countryside. Now I am back in my hometown, live and work here. Single or married? Do you have family? have kids? Neither single nor married. I have a girlfriend but we are not married and do not have kids. What is your mobile model? I had a Motorola Milestone for two years but just got a new one. Xperia Mini Pro, I prefer it handy, you know. What kind of thing do you like the most? I guess, that's having fun. What kind of thing do you hate the most? The lack of common sense, and ignorance. Can you give me a photo of you? Actually, I do not need a car. I live in the old town and can walk to the office. Takes me about 7 minutes. But yes, I have a driver licence. About three or four cups of coffee. Depends on the weather as well. Your favorite movie, book, cartoon character, anime show, TV show, sport? Alright, hard question. I have more than only one favorite movie. Always depends on my mood. So I'll tell you some of my all-time favorites: 300, Star Wars, Batman the Dark Knight, and many more. My favorite book is Silmarillion by J.R.R. Tolkien. Cartoon character? That's Lucky Luke :). And about anime or TV show, I do not really have a favourite one, but I am not a big TV-Fan. Sport? I love running, football, and martial arts. Well, let's move to some details about your job! 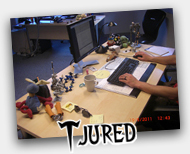 What is your job in CipSoft? Well, as community managers, we are collecting feedback and proposals of the community and forward it to the related departments. Also, we community managers are writing news, messages of the day, moderating facebook and some more paper stuff. We do that for all our products, Tibia, TibiaME, and Fiction Fighters. And of course, we take care of the fansites. How you became CipSoft member? How you know TibiaME? Well, I was searching for a new job and just applied. :) Sometimes you just need some luck. :) Since I play Tibia for kinda a long time I got to know TibiaME soon after I started playing Tibia. So how was your first day as a CM? How your work day looks like? Well, my work always depends on what is going on. Usually, I start the day reading forums and emails. If there are questions I forward them to the responsible departments and wait for answers which I forward then to the community. Then I usually start with facebook, or answering emails. Or I work on some other paper stuff, like gathering feedback, or writing news. All in all, every day is different. How you spend your time in CipSoft? From when did you became a CipSoft member? It is a great job, and I am part of an awesome team. What is your Best moment in CipSoft? The best moment? Definitely, when a player tells you that you are doing a good job. What the most worst thing in your job? Well, I would not call it worst but most annoying part. And that is deleting posts on the forum that are full of insults either against other players or Cipsoft members. Such post do not help anyone and are really just useless. How many Cip-members are there in 2012? Currently, we are more than 60 people working here. What you doing in your normal day? Out of Office, Do you have character in TibiaME? What is your favorite Vocation and why? What is your favorite Island in TibiaME? What is your favorite Creature in TibiaME? What is your favorite Weapon and Armour in TibiaME? Scepter of Fire. And well, armour always depends on. I really love the Pirate Shirt. Harhar! What do you think about autohunt and illegal softwares? Well, that is the bad part of almost all online games. I can totally understand the frustration of players, but we do our best to improve the situation, even if this battle is not easy to fight. Do you think that TibiaME can get better? What do you think about TibiaME fansites in 2012? And why? The fansite admins are doing a great job, even if we can’t give them everything they want. I enjoy to work together with all of you. Of course, sometimes we have different points of view, but that is just part of the business, isn’t it. What is the best question on this interview? Any last words before we .... hmmmm.... finish the interview? Well, thank you for the interview. Keep up the good work! Okay, Thanks Tjured for your time! have a good one!